Imprint Your Logo on a Micro Fiber Screen Cleaner! Serve your customers with the hottest, unique variety of promotional cell phone accessories. Our specialty is promotional screen cleaners that are great at keeping customers' cell phone screens looking clean. Promotional microfiber screen cleaners are useful tools, gets your brand noticed and the user loves the product! Our promotional products will help keep your company top of mind whenever they need to clean their phone, prop it up, or store their cards in the iWallet. The sticky wallet, iWallet, carries your cards with your phone and sticks to any phone or phone case! The Micropad is our general lcd touch screen microfiber cleaner that is washable! Additionally, we offer a very unique screen cleaner that also is a mouse pad! Unique and creativity is what we strive for. Get us your logo so you can get started promoting your company. Check out our products by clicking on the website tabs above for more information and to get an order started. If you want to get started right away go to the bottom of the page to get a free quote or to contact us via email or phone. 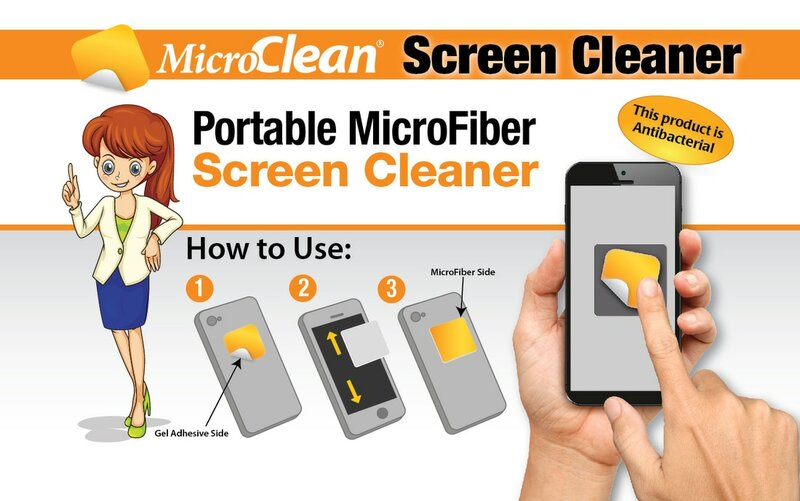 "The people who came by my booth loved the idea of cleaning their mobile screen with our screen cleaners, rather than on their pants. They loved how handy it was too!" "We use the cloths at our own events, as well as using them to promote our meeting at other events. I’ve even had some of them ask where they could purchase them to promote their practices. Not only do they use them for phones, but also for glasses and the lenses of the microscopes that fit on glasses (loupes) used in dentistry. So they are a win-win!" "These screen cleaners are popular for the first time guests at our church. We include them in our welcome packets and people love them. They are handy to put on the backs of your phones and serve as a great advertisement and conversation piece with others." allows you to ​WOW your client. with our sticky gel back. Best Screen Cleaner on the Market! Our screen cleaners come in cloth or sticky form. Sticky cleaners stick to the back of your device without leaving any sticky residue behind. All of our customizable screen cleaners can have anything you want on them, such as your logo or special marketing message. The product can be cleaned with ease and the sticky adhesive back can be restored to optimal stickiness. Also, our sticky screen cleaners are antibacterial as well so you can get rid of germs too. If you have a sticky screen cleaner, all you do is un-stick it from the back of your device and use the microfiber side of it to wipe your screen clean from oils, fingerprints, smudges, dirt and more! "We loved the product, it is a great way to promote our school." "This product is awesome, it works great and the adhesive really sticks to my phone." "Why did I wait so long to use this product!" Turn your MicroCloth into a nonstick mouse pad.